This masculine quilt wall hanging from Sulky of America is perfect for the fisherman in your life. This quick quilt, easily created with the help of a pattern, would make the perfect Father's Day gift. Sewing Machine with an open-toe applique foot. 1/4" foot and 14/90 needle. Trace designs from Pattern onto template plastic. Cut out and label each one. Cut background squares, main rectangle and framing strips. Lay out. Trace around the template applique pieces onto the appropriate wool or flannel colors and cut them out. 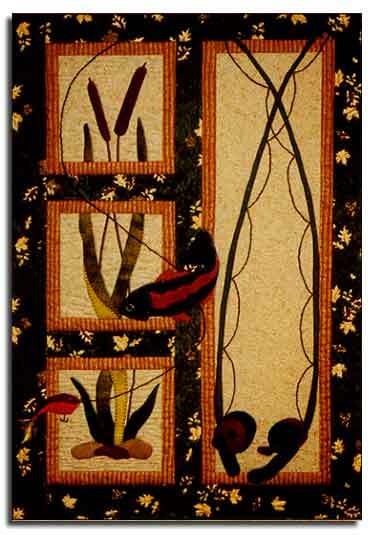 spray the backs of all the cattail applique pieces with Sulky KK 2000 and place them as the finished wallhanging indicates. Use Sulky 12 wt. Cotton to applique using a machine blanket stitch set at the longest stitch length. Piece the sections together using a 1/4" seam allowance. Add the leaf print sashing and border strips. Use the blanket stitch to apply the rest of the appliques as shown on the finished quilts. Layer the quilt, i.e., back, batting and top. Spray baste the layers together using Sulky KK 2000 Temporary Spray Adhesive. Quilt using Sulky 12 wt. Cotton Thread in your favorite method. Add the fishing line. Carol used a 12 wt. cotton and a crochet chain stitch to create the line. A line could also be created by twisting several strands of Sulky 12 wt. Cotton together and couching them down. Make the fly. Around a piece of cardboard about 2" wide (business card size), wind 3 or 4 colors of Sulky 12 wt. Cotton 13-15 times. Thread a hand needle with one of the colors and slide it under and around one edge of the wound Cotton. Tie in a knot. Cut the other edge. Holding the tied end of the Cotton thread, tightly wrap andother one of the 12 wt. colors around it for about 1/4". Thread a hand needle with the end of the wrapping thread and pull it under the 1/4" of wrapped thread to secure the tail. Trim to desired length. You can also wrap a small feather in with the Cotton Thread or add it with glue. Add the hand-made fly to the end of the lure. This one was made with Sulky 12 wt. Cotton by Kenny Genawese. How much does this pattern need to be enlarged? Someone else asked, but I didn't see an answer! How do I get the pattern for the designs in t he fisherman wall quilt?? I'm new to quilting. How much do the pattern pieces need to be enlarged? This pattern is gorgeous. Are there are patterns that are paper pieced?